Many women enter the workforce to fill vacancies left by men leaving for war The Great Migration Begins: Movement of African Americans from the South to the North to find work in Northern factories. These workers filled many jobs left vacant by troops leaving for the war. 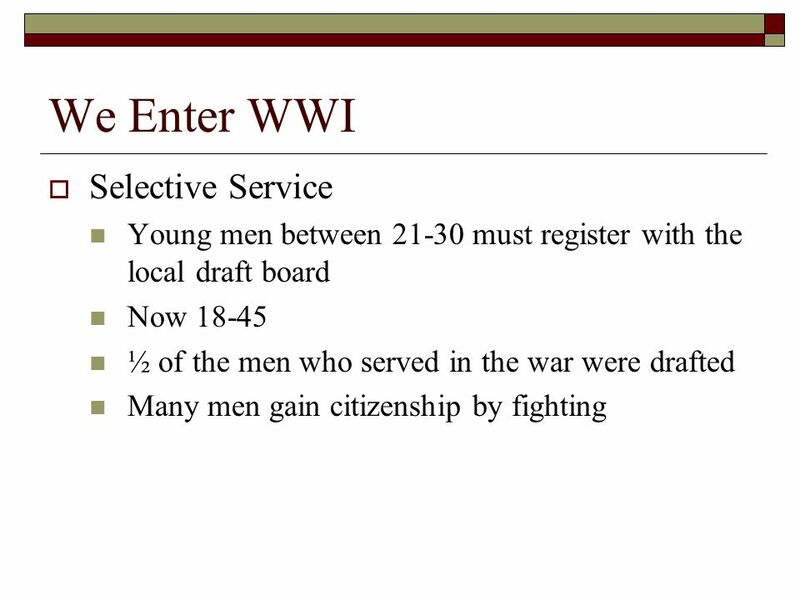 Download ppt "We Enter WWI Selective Service"
The War at Home Mobilizing U.S. declared war and immediately began MOBILIZATION –gathering resources and preparing for war. World War I at Home 1) Identify two ways the Government increased it’s role in society (opposite of Laissez-Faire) 2) Evaluate if it is permissible for. The Great War and Its Aftermath ( ) The learner will analyze U.S. involvement in World War I and the war’s influence on international affairs. World War I America Mobilizes. The Home Front Chapter 15, Section 2. The Home Front during WWI. The Great War http:// m/watch?v=i2CgUIrBHoo m/watch?v=i2CgUIrBHoohttp:// m/watch?v=i2CgUIrBHoo. 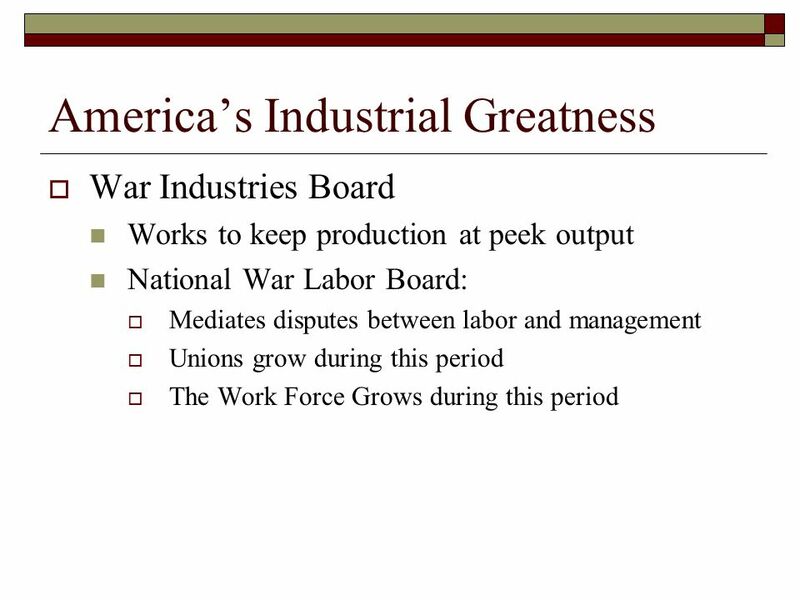 Objectives Analyze how the American government mobilized the public to support the war effort. Describe opposition to the war. Outline significant. Chapter 9, Section 4 The War at Home. United States Entry into WWI-1917. CH MOBILIZING FOR WAR AMERICAN HISTORY. The Home Front During World War I in the United States * Today’s focus will be on the mobilization of the United States’ economy and military in preparation. The Home Front Chapter 16, Section 2. 19.2-19.3 The U.S. Enters WWI. 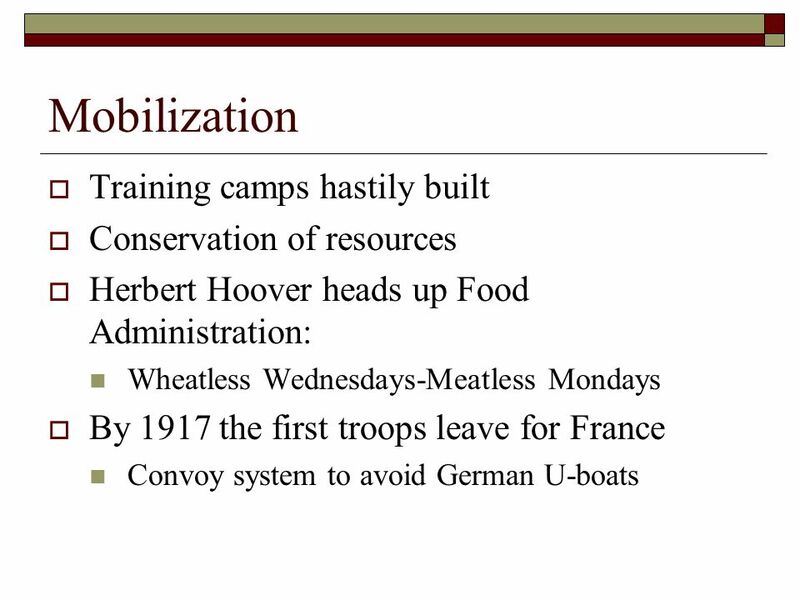 MOBILIZATION  Preparing the U.S. for WWI would require a massive mobilization of: Money Men Materials Minds.